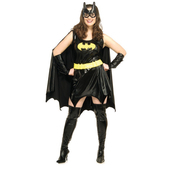 This classic Batgirl Superhero Costume includes black one piece dress with attached cape and embroidered Batman logo. Also included are two glovelets with elastic, designed for slim forearms, rubber belt with velcro, knee high boot tops and signature eyemask. 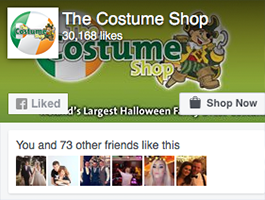 Size Advice: From customer feedback costume is small fitting. We therefore suggest advertised sizes be ideal, these sizes will appear different on the packaging as the manufacturer is based in America. Ran 28 miles comfortably in this. Is not small fitting. .sizes about right. I'm 5'4" size 10 and was very comfortable. It says not to wash but a quick cold water hand wash and do dry and is good to go again. Very happy with the outfit, fitted me grand, not too tight or nething, just right! Only thing i'd complain about wud b the boot covers!! They wudnt go over my boots at all!! So my outfit was imcomplete but didnt matter at the same time because my boots wer up to me knee and i had the cape on all night as the dress was short, but overall i loved it!! I'll definitely b orderin another outfit next yr from this site!! The fit is great. I'm 5ft10 so the skirt was abit short. I just wore shiny leggings with boots.....It looked great and I wasn't thinking about flashing my bum to everyone :) I got alot of compliments while wearing it too! very nice costume. Quite impressed with the quality (maybe because I expected to get something absolutely horrible in touch... :-)). I'm size M /10 UK (sometimes even 12UK) and ordered it in size xsmall . It fits ok, little too loose in few parts (boot covers) but good fitting overall. So be carefull and do not order too big, it's not a small fitting as advertised. great costume. fun to wear. fit is good. Fab, looks brilliant on, can't wait to wear it. 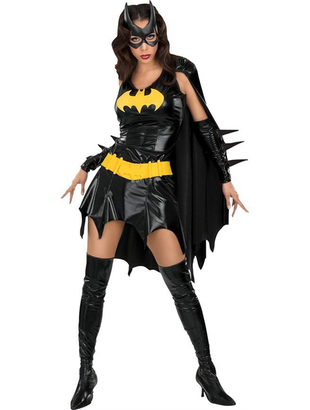 Not too short but would not wear it without the cape as it covers the bum. absolultly brilliant! very good quality! 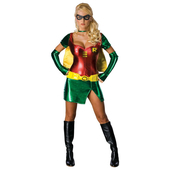 costume looks great, i got size 12-14 as i am a 14 and its even a little baggy but comfortable,so ur nt sucked in, its not as short as the picture either (im 5'6") so its perfect!!!! Dress fitting is appropriate to size advertised and fits well - but for me (5'8") VERY short! -thankfully the cape helps maintain some modesty at back. Boot covers are great and really set off the outfit but at this size they are VERY tight on thigh!